Buy A Siamese Kitten? How, When and Where? Thinking of getting a kitten? Here we take a look at where, when and how to buy a Siamese kitten, and give you some tips on what to look out for. ... are you actually ready to buy your little Siamese kitty? These kittens are ever-so-cute and adorable. They're also active, energetic and very demanding! So you'll need to be sure before buying one that you have the funds, time, energy and inclination to look after it. Here are the most important questions you'll need to ask yourself before you go ahead and buy a Siamese kitten. Are you prepared to cat-proof your home? Kittens of this breed are masters of climbing and escapology, and whether you eventually intend to have an 'indoor' or an 'outdoor' cat, kittens must be kept inside to begin with. Will you play nursemaid? Clean up after your kitty? Cats get sick from time to time and you must be prepared to nurse them when they do. Is someone at home during the day? These cats love to be around people and will get bored and lonely left by themselves. Do you have enough money to pay veterinary bills? Buy pet insurance? Cat costs can mount up over time. The best place to buy a Siamese kitten is from a breeder. Don't be tempted to buy kittens from a pet shop, however cute they may look – you won't know where they have come from (pet shop kittens sometimes come from cat farms), you won't know how healthy they are, and it's very unlikely that they will have proper pedigree certificates. So the first thing to do is to contact several (three or four is good) breeders in your area. Most of them will be delighted to talk to you about their cats. Find out if they have any kittens for sale and how much they charge for them, and arrange a visit. Buying a Siamese kitten is a two-way process. Breeders will want to know just as much about you as you want to know about their cats, and that you're a suitable prospective parent for their precious babies. Your next move is to visit a few breeders. Don't go to more than one a day though, in case you spread infection – you won't be very popular if you do! And only go and visit a breeder if you are seriously intending to buy, as breeders don't appreciate time-wasters! When you get there, look for roly-poly, clean kittens that smell nice. They should be inquisitive and happy to be handled. Kittens shouldn't have dirty ears, runny eyes or noses, or show any signs of a cold. They should also have clean bottoms (a dirty rear end is a sure sign of illness). Pedigree kittens should come with registration and pedigree certificates and are generally sold with several (usually six) weeks' worth of insurance. They should also have had their vaccinations against feline infectious enteritis (panleucopaenia), cat 'flu (rhinotracheitis and calicivirus), and in the United States, rabies as well. All these are compulsory. You should be given the certificates for these when you collect the kitten, and it will be your responsibility to have all vaccinations renewed annually. The breeder may also give you a starter pack of food, or at the very least, details of what the kitten has been fed on up till now so that you can continue with the same food. It's likely that you'll be asked to sign an agreement that you will have the kitten spayed or neutered when it is six months old. 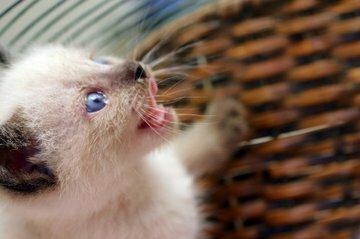 Breeders may allow their kittens to be viewed from around six weeks onwards, but you won't be allowed to buy a Siamese kitten and take it home until it is thirteen weeks old. This is to allow time for your kitten to have had its early vaccinations and to have become well-socialized and used to all the goings-on in a busy household. If you're ever offered a Siamese kitten that is younger than 12-13 weeks, don't buy it. It's unlikely to have had all its vaccinations, and will probably be too young to have been properly socialized. How much does a Siamese kitten cost? Pedigree cats are generally expensive, kittens more so, and the cost depends on the pedigree and quality of the kitten. For a pet-quality cat in the UK, expect to pay around £250-£400. In the USA, $400-$600. Still keen to buy a Siamese kitten? I hope the information above helps you to find the kitten of your dreams. Good luck! All that remains is to wish you many years of fun and friendship with the new addition to your family, and do come back and share news of your kitten's progress.